The Monte Velho Equo Resort is a boutique resort located on a Lusitano breeding farm and is an ideal base from which to experience world class dressage instruction and trail riding. The property blends with the surrounding countryside which one can explore by horseback, and the rooftop pool offers amazing panoramic views of the Alentejo region. The resort can provide riding according to your level of experience, including both dressage lessons and trail rides. The stud farm has been dedicated to breeding Lusitano horses for the sport of dressage since 1994. 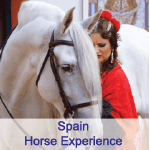 The horses have wonderful gaits and characters and have been very successful in competition, and the lesson horses can provide the thrill of such movements of passage, piaffe, flying changes and pirouettes under instruction of talented professional instructors. The horses are Lusitano horses at Monte Velho. Some, for experienced dressage riders, are trained to a very high standard and can do the Grand Prix exercises. Only a few are used for the trail rides. Some prior knowledge of dressage is useful to get the most out of dressage instruction, for instance an understanding of lateral movements such as shoulder-in and half pass. You should be competent at walk, trot and canter with a willingness and openness to learn. There may be more than one lesson going on at the same time, but each lesson has a maximum of two riders. You will work in open order. Each lesson begins by riders leading their horse to the arena and walking them round to warm them up a little for 5-10 minutes before mounting. Lessons may be taken in the indoor arena, in the covered school or in the full size outdoor arena. In addition to lessons, Monte Velho has unique conditions for trail riding, taking advantage not only of their 620 acre property, but also all the surroundings which have been classified as a National Ecological Reserve. It is possible to ride through this absolutely stunning area for several hours without ever crossing paved roads. Depending on the program chosen you may ride once or twice a day in lessons or on trail rides. There are currently 20 Lusitano horses at Monte Velho available for guests. Some, for experienced dressage riders, that are trained to a very high standard and can do the Grand Prix exercises. Of these 20 horses, 3 are purely for trail rides. Those choosing trail rides, either one or two rides a day, will enjoy riding out from the farm onto the property which lies inside an ecological reserve and also onto neighbouring properties. The pace will be leisurely but usually there are some opportunities for trot and canter. There is a rider weight limit of 90kg (in riding clothes) and currently only one dressage horse able to take this weight, so please check with us in advance. The owner of Monte Velho is a leading architect and the accommodation has been designed to a very high standard. The dining and guest lounge area is spacious and comfortable with views over the property. There is a new wellness centre, with exercise area, sauna and rooftop jacuzzi overlooking the lake. There are seven premium rooms, with en suite bathrooms. The premium rooms are furnished to a very high standard, with a large picture window and veranda looking out onto the countryside. Two have large double beds, whilst the others can be either doubles or twins. There are coffee-making facilities in these rooms. In the original buildings of the farm, there are two standard rooms which look out over the lake. Each has an en suite bathroom. These rooms are smaller, but are furnished to an equally high standard. They have twin beds and coffee machines. Note: *Please ask for a conversion to AUD rates. We use the ANZ bank sell rate. Please enquire for non-riders and shorter program rates. Accommodation; all meals from dinner on day of arrival and breakfast on day of departure. Wine with lunch and dinner (maximum one bottle for 2 persons); soft drinks with lunch and dinner; coffee/tea with meals; riding as per chosen programme. Single room supplement on application. Payable locally additional alcohol, soft drinks, gratuities, massage and off site excursions. Transfer from Lisbon Airport are approx $189* per vehicle each way (maximum of 4 people) – payable locally *Subject to price changes. Lisbon, Portugal is the closest airport. The property is approximately one hour and 30 minutes by car from Lisbon Airport. The resort is in the Alentejo region of Portugal which stretches from the River Tagus to the Algarve. The Alentejo has hot, dry summers and mild winters. Spring (April to June) and Autumn (September to October) are a lovely time to visit. The days should be pleasantly warm with day time temperatures up to 25C and so not too hot for riding. Summer (July/August) can be hot and day time temperatures could reach high 30C’s when the swimming pool will be a highlight. Winter brings cool days and some rain, with day time temperatures of c. 15C.